Get notified when Fleetwood Mac tickets are available! Fleetwood Mac is a famous rock and roll music group that has been performing together since 1967. Typically categorized as soft rock, Fleetwood Mac’s music has won the band multiple Grammy awards. Their album Rumours is one of the top 10 best selling albums of all time, having sold more than 40 million copies. 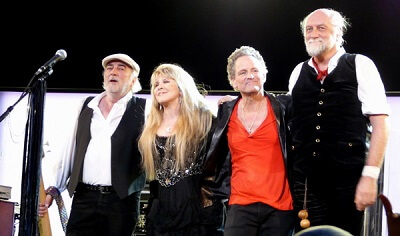 The band is made up of Mick Fleetwood, John McVie, Christine McVie, Lindsey Buckingham and Stevie Nicks. Their hits include “Landslide,” “Go Your Own Way,” “Rhiannon,” “Dreams” and “The Chain.” Members of Fleetwood Mac continue to tour, and you can purchase Fleetwood Mac tickets for an upcoming show using the links above.